Can you put a price on "Respect"? It likely isn't zero. Yet, ironically, Aretha Franklin's version of this classic empowerment anthem has never earned one penny for the singer in its decades of airplay on American radio stations. Franklin isn't alone; the elite company includes Whitney Houston for her cover of Dolly Parton's "I Will Always Love You" and Jeff Buckley for his version of Leonard Cohen's "Hallelujah." Due to a legal precedent that holds firm despite decades of protest, American AM-FM radio stations are only obligated to pay the writers of the songs they air, not the performers. So every time a commercial station cues Franklin's gale-force 1967 rendition of Otis Redding's "Respect," it is Redding's estate that reaps the royalties - and the same structure applies to all musicians who appear on recordings but aren't credited as songwriters. In resisting paying artists for airplay, America is the only democratic, industrial holdout on a short list that includes North Korea, China, Rwanda and Iran. It is a contentious, labyrinthine issue that has long pitted musicians against increasingly conglomerated AM-FM stations ("terrestrial" stations, in industry jargon). Now a one-year-old volunteer organization of artists aims to mobilize their fans into changing the situation. 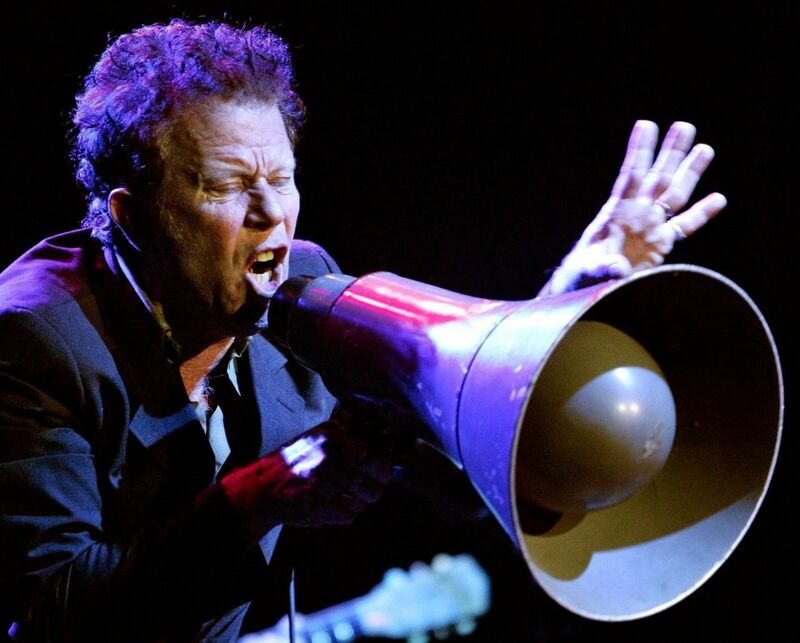 The Content Creators Coalition - which counts Tom Waits, Cake frontman John McCrea and David Byrne among its supporters - will sponsor the Artists' Pay for Radio Play rally and concert at New York's Le Poisson Rouge nightclub on February 25. The event will feature performances by Byrne, McCrea, Mike Mills of R.E.M., avant-garde guitarist-composer Marc Ribot and others. Chris Ruen, author of Freeloading: How Our Insatiable Hunger for Free Content Starves Creativity, will emcee the evening. "I think a lot of people aren't aware of the situation," Ruen, who organized the event with Ribot, told Newsweek. "Those marginal payments that artists and session players are missing out on can make the difference between someone being able to continue their career, someone being able to live a life of dignity." "It seems like a morally obvious, low-hanging-fruit sort of issue... Sometimes the people who created the part of the song you remember have been left high and dry," added McCrea, pointing to the $17 billion in revenue that commercial radio stations made last year. "When huge companies sell advertising on the backs of our work, the people that made that work should get something." The free event will urge fans to sign an online petition - which Byrne supported eloquently in a recent essay for Vloggerheads.com - and pressure Congress to pass a bill guaranteeing performer's rights on commercial radio. (The coalition isn't requesting royalties from nonprofit and college stations.) Should such legislation reach Capitol Hill, it wouldn't be the first time; last fall, Representative Mel Watt (D-N.C.) introduced the Free Market Royalty Act, which stalled after he left the House of Representatives. In 2010, the similar Performance Rights Act faltered in Congress even after endorsement from the Obama administration. Frank Sinatra advocated such copyright restructuring; so have George Clinton, Sheryl Crow and will.i.am. One thing remains consistent: Commercial radio's chief argument against performer royalties. "The promotional value of local radio is so exceptional and extraordinary that it generates enormous revenues for both artists and labels," said Dennis Wharton, executive vice president of communications for the National Association of Broadcasters, a D.C. nonprofit that represents radio networks including Clear Channel. "A fee that would be attached to radio stations beyond the songwriter fees that we pay could have a serious negative financial impact on local radio. It could encourage stations to simply stop playing music." Artists' pay advocates, including SoundExchange and the MusicFirst coalition, argue that radio promotion is deflated currency in an era of streaming and social media, equating the current system to theft. "If I wrote a blockbuster novel and you wanted to make a movie out of it, it would be beyond dispute that it will promote my book," said Michael Huppe, SoundExchange president and chief executive officer, "but nobody would ever suggest that you take my entire storyline for free and use it in your movie." Adding to artists' indignation is the fact that they are losing performance royalties abroad, too. Since foreign performers are not paid for radio in America, those countries' collection organizations often refuse to pay American artists. Said Ribot, "I tour mostly in Europe; my records play on radio mostly in Europe, and I also tour in South America and Japan. As of today, those royalties are being withheld. If they were paid, it would make a difference in my life." For now, after their New York rally, the Content Creators Coalition intends to apply for nonprofit status and may stage another event on the West Coast in the spring. Its members are optimistic for their cause. "This is sort of historic. I don't think artists have organized this meaningfully in a long time," said McCrea. "It's about artists standing up for themselves.... We're going to stay on this issue as long as it takes."